The Aurora Optima Nero Perla, in Aurora's simple, yet gorgeous, presentation box. The Italian pen companies always seem to do packaging well. Aurora is one of the three remaining major Italian pen companies, now that Omas is out of business. It's also a company with which I have relatively little experience, at least with respect to their fountain pens. I'm a huge fan of Aurora's inks: they make two colors, black and blue, and both are among my go-tos for safe, standard colors. I've owned an Aurora Ipsilon Quadra in Sterling Silver, and while the pen was nice, it didn't stick in my collection. Recently, my friend Thomas decided to unload a few pens in his collection, and asked whether or not I would be interested in reviewing one of Aurora's flagship pens, the Aurora Optima, before he sold it. I've always wanted to test drive one of these pens, so I jumped at the chance. 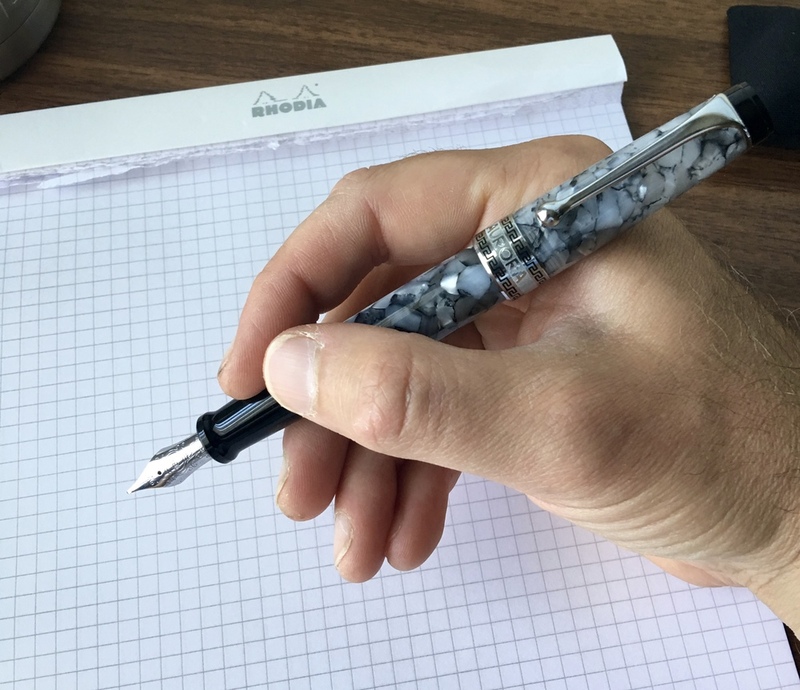 The Aurora Optima Nero Perla is a visually stunning pen. The material (which the company refers to as "Auroloide") is cellulose acetate: an acrylic variant intended to reproduce the depths of color and warmth found in vintage celluloid, but without the long curing period and manufacturing difficulties. Indeed, the Optima feels like a celluloid pen in hand. The material is slightly translucent, allowing you to see the ink level once the pen is filled. This particular color scheme is called "Nero Perla" ("Black Pearl"). Trim appears to be a combination of sterling silver and Rhodium plating, and the piston-filling system gives the pen heft. This pen feels solid, like it will stand up to heavy use. The one critique I have on the build, however, is how difficult the pen is to clean. Aurora's piston fillers have a "hidden reservoir" of ink behind the piston, which they pitch as a feature that allows you to write for a full page after the main ink chamber is empty. I can see this feature being useful if you carry one pen, and take a lot of notes in meetings, etc. where you wouldn't want to run out, but it also means that it takes a LOT of flushing to get rid of all the ink. If I had kept this pen, it would've ended up as a "one-ink pen" just to avoid having to deal with the cleaning. The Aurora Optima features a 18k nib. This one started life as a medium but has been ground to a cursive italic. The nib on this Optima was tuned and ground to a smooth .4mm cursive italic by either Mike Masuyama or Shawn Newton - Thomas couldn't remember. (Hey, that happens when you have so many pens!) It's an excellent writer, though I can't speak to how the pen wrote straight out of the box. Other Aurora pens I have tried have been nice writers, though the nibs tend to have feedback. They're not scratchy, but they're not glassy smooth either, which isn't an issue for me but can drive some people crazy. This .4mm cursive italic (formerly a medium nib) writes perfectly for me. Ink is Aurora blue. The Optima's 18k nib is a better writer than the nib on my old Aurora Ipsilon Quadra. The nib is stiff, without much give or flex. If you like firm nibs, you'll like this pen. A close-up of the Optima in its box. You can get a sense of the translucency of the material if you look just below the cap, where you can tell the pen has been filled with blue ink. The Aurora Optima Nero Perla is a gorgeous Italian fountain pen. As a fan of celluloid (and celluloid-like material), I appreciate the craftsmanship that goes into making a pen look this good. At the same time, the price point is very high, even taking into account the recent price drop That's not to say I think the pen is unreasonably priced - it's not, given the quality of the craftsmanship and the materials used - but Sailor's Professional Gear series has a similar shape and fits my hand better at $200 or so less. I do know, however, that there are people out there who find the Pro Gear too small and light, especially when writing with the pen unposted. Fortunately, if you're interested in the Optima, Aurora recently dropped the price. Both Pen Chalet and Anderson Pens carry Aurora, and both currently have the Optima listed at $445. Aurora issues annual "special edition" versions of the Optima, so if you're a fan of gold trim, you'll want to check out the "Abissi" Optima 365 Limited Edition. If you're a fan of cursive italic nibs, and you'd like to purchase a barely-used Aurora, Thomas is offering the pen featured in this review for sale. As of the time of writing, the pen is up on my "For Sale" page and priced to move (especially once you take into account the custom nib, which otherwise would add $40-50 to the price, not to mention the wait time for nib work). DISCLAIMER: The pen featured in this review was loaned to me at no cost for review purposes. This post contains affiliate links, through which I may be compensated a small amount if you purchase an item from any of the sites linked to in this article. While I'd greatly appreciate it if you use these links to purchase something you are interested in, you are, of course, under no obligation to do so. Many thanks!